papers delivered at the 2014 AHA conference. 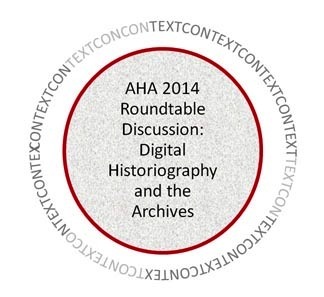 The following series of blog posts by Joshua Sternfeld, Katharina Hering, Kate Theimer, and Michael Kramer is based on our session at the AHA meeting in 2014 on Digital Historiography and the Archives. We conceptualized the session as an interdisciplinary round table discussion. Short presentations by each panelist led to a rich and multifaceted discussion with the audience. Expanding upon this format and our engaged in-person discussion, we hope that this series of linked blog posts will serve as a virtual, extended round table. Because it exists in the liminal, intermediary space between traditional conference session and formal publication, we imagine it as an experiment in new forms of “open source” scholarly communication. We will post our discussion papers in sequence with a concluding summary of the discussion that took place at the session itself. In sharing our work in provisional form, we encourage readers to continue this discussion on the blog by posting comments, ideas, reflections, and criticisms. If you wish to use this material in another place or venue, we ask that you contact each presenter directly for explicit permission to quote from the works presented here. The contact information for all presenters can be found at the end of this introductory post and in each subsequent post. All participants in the panel echoed Sternfeld in emphasizing how archival theory and practice need to be an integral element of such a critical framework, along with evolving historiographical and professional practices. The digital medium has challenged historians to expand their knowledge about archives, and understand their function in generating scholarship and knowledge. But what might be the key theoretical and methodological questions raised by digital archives or digital collections as they pertain to historical practice? What materials do archives collect and preserve, and why? Which materials are selected, and which are excluded? What are the driving forces and principles guiding the contextual information about collections provided by archives? Which political, social, economic, and cultural power relationships now structure the archives? These are the questions that archivists and historians might come together to confront in critical and productive ways. Fortunately, not only has the digital medium unleashed a heightened awareness of established archival principles and historical practice, it has also introduced new lines of theoretical inquiry. Historians and archivists are beginning to work with sources of varying scope, format, and provenance, thereby challenging both fields to reconsider the limits of historical inquiry, the contextualizing properties of metadata, the design of access systems, and the engagement of new audiences. In short, trends in digital scholarship and practices have contested our collective conception of “ the archive” as well as the role of the 21st-century historian. What became evident from the session was that historians must collaborate with information professionals, including archivists, to create critical contextual information for sources, reference resources, and repositories as well as new kinds of scholarly work that harnesses the power and registers the challenges of the digital archive, while serving a diverse community of users composed of researchers, educators, information professionals, students, artists, policymakers, and members of the public as a whole. The question is how? What areas of research should be explored and what methodologies and theories are already under development? We hope that sharing materials from the roundtable, even in provisional form, can provide a catalyst for a sustained discussion. The panelists say there is a need for “new kinds of scholarly work that harnesses the power and registers the challenges of the digital archive.” I am working on a project, Beyond Citation, for the Digital Praxis Seminar at the CUNY Graduate Center that will address some of their concerns. Beyond Citation seeks to encourage critical thinking about academic databases and their impact on research and scholarship by creating a website to aggregate bibliographic information about major humanities databases such as those published by ProQuest or Gale. Despite the ubiquity of databases, knowledge about how they work is extremely limited and academics are often unaware of the constraints that databases place on their research. Lack of awareness means that scholars cannot account for how databases affect their interpretations of search results or text analysis. Beyond Citation will synthesize and codify knowledge about databases to enhance scholars’ ability to understand the significance of the material they have gleaned. There will be information about search and collection level information such as content, provenance, legibility, and errors as well as guidance about digital research practices. An abstract for the project is at [https://drive.google.com/file/d/0BwBK0-G5eXbMYTVoMkxacTJJRU0/edit?usp=sharing]. Please feel free to add comments or to contact me at the email address listed on the abstract. My plan is to build an early version of the website during the Spring 2014 semester with other students at the Graduate Center. The benefit of encouraging critical thinking about databases is more than merely facilitating research. Critical thinking about databases counters scholars’ “tendency to consider the archive as a hermetically-sealed space in which historical material can be preserved untouched” (Mussell 89) and “[forces] a recognition of the constructed nature of evidence and its relation to the absent past” (Mussell 91). To think about these issues, besides my own project, I want to refer people to historians doing some of the most exciting and insightful work taking place today in the area of digital history. Anything that Jo Guldi publishes on the subjects of historiography, databases and text analysis is indispensable. James Mussell’s writing bridges the concerns of traditional humanists and digital practitioners instantiating a theory of digital history methods in the “shift from documents to data” (80). If you are at all interested in digital history, their work is essential. “The Return of the Longue Durée,” written by Guldi and David Armitage, calls for historians to use digital methods to analyze millions of texts spanning centuries. (See below for link to the preprint.) In another article, “The History of Walking and the Digital Turn,” Guldi takes the reader through her analysis of huge corpora of texts, articulating the perils of working in databases and interpreting their data. She has created a method “using multiple databases and keyword variants” by which “the historian may gain confidence in a particular chronological intervention” (116). ← What Is Folk Music, Anyway?